About a quarter of Puerto Rico will regain power by next month, said Puerto Rico's governor, Ricardo Rosselló, said at a news conference Monday. About 10 percent of households are expected to have electricity in the next two weeks. The governor also said that almost half — 47 percent — of residents have running water and the number should climb to 60 percent by the end of the week. About 40 percent of Puerto Ricans have cellphone service, he reported, though some areas are still cut off from communication. Nevertheless, 12 of the 78 municipalities have not been able to go to the designated distribution centers to get necessary supplies, the governor said. A day before President Donald Trump is scheduled to land in the hurricane-ravaged island, Rosselló described details of the operations as the government wrestles with the lack of power and the critical issue of how to distribute water, food and medicine to neighborhoods and towns. One of the most urgent issues following the hurricane was getting diesel fuel to hospitals so they could run on generators; some hospitals have shut down temporarily after running out of fuel. 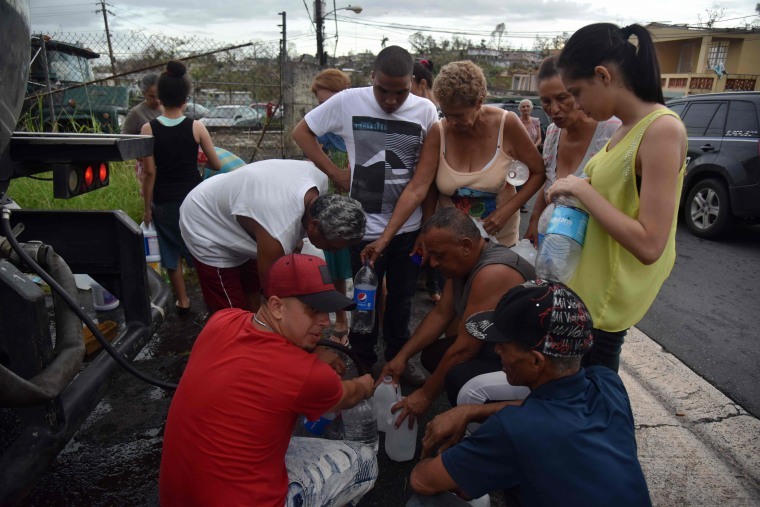 Rosselló said 10 hospitals now have power and two others could regain electricity on Monday. The government announced that gas stations would be allowed to operate 24 hours a day as long as they had proper security measures. There are still about 8,000 people in 139 shelters around the island. As of Sunday there were about 1,032 active personnel on the ground in Puerto Rico and the U.S. Virgin Islands, and another 2,243 aboard Navy ships off the coasts. By contrast, a Democratic congressional aide who conducts oversight of military matters told NBC News that "Katrina had 20,000 active troops and 40,000 national guard." The governor, who supports statehood for the island, waded into political waters at the news conference, telling reporters that the "root" of Puerto Rico's problems stem from its disadvantage compared with other states. Rosselló said that as long as Puerto Rico is the oldest "colonial territory" in the world, the island's problems will continue to grow. He added that the U.S. should not push Cuba toward democracy if it can not take care of its own "backyard." In Florida, home to the nation's second-largest Puerto Rican population, Gov. Rick Scott declared a state of emergency in all 67 counties to help families affected by the hurricane in Puerto Rico. "With families displaced by Hurricane Maria already present and still arriving in Florida, it is critical that our state is prepared to provide the resources they need upon entering our state," Scott said in a statement. White House spokesperson Sarah Huckabee Sanders told reporters in Washington, D.C. on Monday that San Juan mayor Carmen Yulín Cruz, who Trump criticized on Twitter after she made a public pleas for help, was invited to Tuesday's event with the president in Puerto Rico.